Shortly after digging into The Happiness Project, I was motivated to pick up this book I had started a while back to tackle a few areas of organizing that I struggle with. The first few chapters deal with the emotional and financial cost of clutter and hoarding. I'm not a hoarder and my house is fairly organized and neat, but I always look for ways to improve and get the rest of my family on board without nagging. Because, as most parents know, a house can be clean and neat, but within a few hours of kids playing or with the rushed daily activities it can start looking like a tornado went through it. Argh! I focused on Chapter 3 that helps to get the whole family on board because I am the type of parent that has to fight the urge to do it all myself. I tend to be a perfectionist. I'm still working on this. Chapter 5 on laundry had useful tips, but most of the book tackles all the problematic rooms in a house and what to do with stuff you want to recycle or give away. This is an easy book to read, and a reader can quickly go to the chapter that grabs his attention or problem area depending on what he has most difficulty organizing or uncluttering. It comes with an extensive bibliography with links to resources too. Chapter 4 on conquering clutter zones had me thinking of possible solutions for my home. It seems that the older the kids get the more we accumulate, and finding room for all of it can become daunting. The advice on what to do with kids' stuff was good. The book is interspersed with boxes of “oppress the mess” tips, case studies of experts in the organizing field who share their particular expertise, charts, lists, questionnaires, and black and white photos. The large font and bullet format make it easy to assimilate the information quickly. This is a great resource I will be referring to as I get into my spring cleaning. It offers good ideas, solutions and support to the overwhelmed parent. 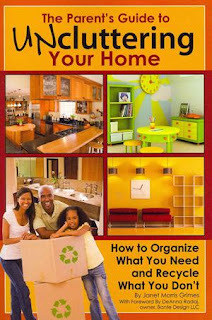 I also found it empowering as I realized that I am actually doing a lot of useful and practical things to keep my family and home organized.